This European Single Market Directive covers pressure equipment and assemblies with a maximum allowable pressure PS >0.5 bar. Adopted 29 May 1997; came into force 29 November 1999. See information below under the Pressure Equipment Regulations 1999. The Pressure Equipment Directive has been implemented in the UK by the Pressure Equipment Regulations 1999 (SI 1999/2001). PER came into force on 29 November 1999 and was amended by SI 2002 No 1267 which came into force on 30 May 2002. For a list of Conformity Assessment Bodies accredited under PED follow links on the Department for Business, Innovation and Skills (BIS). HSE and local authorities are responsible for enforcing PER. Pressure equipment – vessels, piping, safety accessories and pressure accessories. Where applicable, includes elements attached to pressurised parts such as flanges, nozzles, couplings, supports, lifting lugs etc. Vessel - a housing designed and built to contain fluids under pressure. Includes its direct attachments up to the coupling point connecting it to other equipment. A vessel may be composed of more than one chamber. Piping - piping components intended for the transport of fluids when connected together for integration into a pressure system. Includes a pipe or system of pipes, tubing, fittings, expansion joints, hoses, or other pressure-bearing components as appropriate. Heat exchangers consisting of pipes for the purpose of cooling or heating air are considered as piping. Safety accessories - devices designed to protect pressure equipment against the allowable limits being exceeded. Such devices include devices for direct pressure limitation, such as safety valves and bursting discs etc, and limiting devices which either activate the means for correction or provide for shutdown or shutdown and lock out, such as pressure switches or temperature switches etc. Pressure accessories - devices with an operational function and having pressure-bearing housings. Assemblies - several pieces of pressure equipment assembled by a manufacturer to constitute an integrated and functional whole. Schedule 2 of PER details the essential safety requirements (ESR) that qualifying vessels must satisfy. Additionally, there are details of how the different products are classified, the technical requirements that must be satisfied, and the conformity assessment procedures that must be followed. See FAQ section for advice on how to comply with the ESRs - essentially, by either producing a technical file that addresses each ESR in turn, or manufacturing using standards that have been listed in the EU's Official Journal which give a 'presumption of conformity' to specific ESRs. The Department for Business, Innovation and Skills (BIS) has produced a very useful guide to the Pressure Equipment Directive (PER). Annex C has an easy-to-use flow chart showing how equipment should be classified depending on, for example, what it is designed to contain and the operating pressure; also the conformity assessment procedure to be followed before placing the equipment on the market. SPVD is one of the 'New Approach' Directives that set out 'essential requirements' (for safety, for example), written in general terms, which must be met before products are placed on the market in the UK or elsewhere in the EC. European standards fill in the detail and are the main way for businesses to meet the 'essential requirements'. The Directives also say how manufacturers are to show that products meet the 'essential requirements'. Products meeting the requirements are to carry CE marking, which should mean that they can be supplied anywhere in the EC, provided they are safe. The Simple Pressure Vessel (Safety) Regulations 1991 implement the Directive in the UK. Schedule 1 of SPV details the essential safety requirements that qualifying vessels must satisfy. It also gives details of how the vessels should be categorised, the technical requirements to be satisfied, and the conformity assessment procedures to be followed. The duties imposed by PSSR relate to pressure systems for use at work and the risk to health/safety. The aim of these Regulations is to prevent serious injury from the hazard of stored energy as a result of the failure of a pressure system or one of its component parts. Before using any qualifying pressure equipment (new or otherwise), a written scheme of examination (WSE) must be in place, and an examination undertaken. Relevant fluids do not include hydraulic oils. Hydraulic systems, while using high pressures, do not store energy in the system and so are not covered by this legislation. The PSSR Approved Code of Practice (ACOP), Safety of pressure systems (L122), provides a useful flow chart to help determine which regulations (if any) apply. Twenty-five complete exceptions are detailed in PSSR Schedule 1 Part I. Three partial exceptions are detailed in PSSR Schedule 1 Part II. If in doubt, the useful and instructive ACOP Safety of pressure systems provides additional information and advice. There is a difference between a pipeline and pipework. The easiest way to distinguish between the two terms is to remember that pipelines cross boundaries and pipework does not (except where there is a common supply to a number of units). The terms also include associated protective devices, valves, compressors etc. The PSSR ACOP Safety of pressure systems (page 4) provides useful definitions of pipework and pipelines as these can vary between different regulations (specifically PSSR, PER and the Pipeline Safety Regulations 1996). Who has duties under PSSR? The user of hired or leased equipment should make sure that the WSE is in place and that the certificate of examination is also current. PSSR Schedule 2 allows a supplier of an installed system to assume responsibility in writing for the WSE, the operation, the maintenance and the record keeping. An important feature of the in-house competent person is that they should be independent from the operating functions of the organisation, and they must have sufficient authority to stop the use of the pressure equipment should the need arise. 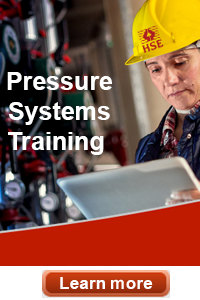 For more detail about the role and responsibilities of the competent person see the Approved Code of Practice (L122) Safety of pressure systems, particularly paragraphs 35 to 43 and 104 to 108.